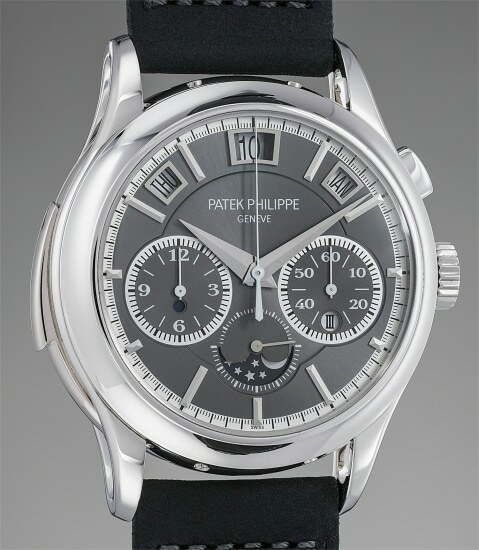 Reference 5208P can be considered one of the contemporary masterpieces of the Patek Philippe production. It incorporates a minute repeater, an instantaneous perpetual calendar and a single button chronograph. Thus, it is characterized as a classic Grand Complication, definition reserved only for the timepieces featuring a calendar complication, a chronographic complication and a chiming complication at the same time. The present timepiece however pushes the technological boundaries even further: the perpetual calendar is displayed through three windows at 12 o’ clock, which instantaneously and synchronously jump precisely at midnight. This solution - beyond granting the calendar display minimalist and enormously elegant looks - avoids misreadings due to the classic lengthy date change solution. In order to achieve this, a very specific module (composed by a large lever made out of 15 different pieces) had to be developed in order to transmit the exact amount of power at the correct instant. Furthermore, the calendar is accompanied by the moon phase display, a staple of Patek Philippe perpetual calendar timepieces. The intricacy of this movement becomes apparent when considering it is made out of a mind-blowing 701 components in total. The mastery of Patek Philippe went well beyond the making of a complicated movement. The company managed to achieve an extremely uncluttered and elegant dial layout notwithstanding the technical challenges. For example, an intricate system of mechanical deviation had to be developed for the chiming system to correctly “read” the time without interfering with the disposition of the chronograph indications. Also the single button chronograph can be seen as an effort to streamline and de-dramatize the aesthetics of the model. Produced in extremely small amounts since 2011, this masterpiece is reserved only for the most distinguished Patek Philippe clients and it is without a doubt destined to become one of the great classics of the company's production. The present example is offered by its original owner and comes with all of its original accessories and even a second Patek Philippe display winding box. Discontinued in 2018 (from last year, only the pink gold version is available), the fact that this is the only third example in platinum to appear on the market highlights the level of attachment collectors show for this outstanding model and the consequent difficulty in sourcing it.